This is a special commemorative bat just released by Louisville Slugger to honor the Cleveland Indians and the team's AL record setting 22 consecutive wins. 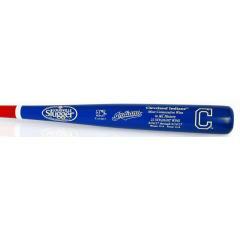 This is a full-size, authentic Louisville Slugger Bat custom engraved to honor the 2017 Cleveland Indians. It includes the dates between which the team amassed its record-setting 22 consecutive wins, as well as the home and away splits - an impressive 11-0 both at home and on the road. Add this limited edition piece to your collection today.